I just listed a new workshop for Saturday, May 11th at City Home in SE Portland for a special Mother’s Day class. We’ll gather around the table, workshop style (my favorite—but I might be biased) to dive into all things brush calligraphy—if you’ve been admiring all the eye-catching styles of brush lettering, now you can learn how to create it yourself! Join solo or bring a friend or loved one. We’ll have mimosas, a beautiful space, and good company and you’ll get your very own take home calligraphy kit with my favorite brush calligraphy materials. The fun part? You’ll get to create a print at the end to take home or gift to a beloved mother in your life. Sign up to get 10% off your first class registration and receive all kinds of calligraphy tips and resources delivered straight to your inbox! When it comes to practice, if you wait for an expanse of time free of interruptions, it’s likely that it won’t happen very often. There are a million other things that can come in the way, and I’m sure you can think of a few right off the bat. But, if you’re like me and you wonder how you’ve managed to spend way too much time scrolling mindlessly on social media or perusing that new app you downloaded, you’ll quickly realize those little bits of time really add up. What if you take those extra minutes and do something else? You might not have three hours, but you might have ten minutes. If you head a few posts back, I talk about this, and it’s really a shift in mindset. Because it begs the question, what are you doing with those in-between bits of time? What about ten or fifteen minutes after dinner or before you start your day or while you’re waiting on someone? Because the key to improvement is practice, and the key to practice is often as simple as starting. It doesn’t have to be perfect practice, or every-single-day practice, or even long stretches of practice. It’s simply putting pen to paper and making those shapes. I want to help you make that happen. I’m excited to be sending over some tips, resources, words and phrases to practice over the coming weeks for #20calligraphyminutes. Ready to join in? Sign up to receive the emails as they’re sent out. I’d love to help you make time for some creativity in your life! Join me in #20calligraphyminutes and get tips and resources as they’re sent out to kick-start your practice! I had such a fun group to kick off the first calligraphy workshop at Buttercraft in SE Portland, Oregon. With wine bottles lining the wall and a decadent butter display—it’s my kind of place! The food and wine were top notch, Milla and Sami were wonderful hosts, and we had ourselves a wonderful time. A few students were joining in for their first class and a handful of students had already joined me for the Intro to Modern Calligraphy workshop (both are beginner classes, so there’s no specific order). We covered all of the beginning skills to kick off a brush lettering practice. Get Your Calligraphy Pen and Write Words You Love! Hey, friends. I want to inspire you to carve out a little time this weekend to write. It’s still early here on a Saturday morning. It’s going to be warm and sunny. So while it’s still early and my tea is steeping, I’m taking a few minutes to break out my calligraphy pen, Nikko G nib, and ink and get started with some modern calligraphy. And here’s the thing, I think these words from Elizabeth Gilbert are important. If you write words that are meaningful to you, if you write what you really want to say, the process will be much more enjoyable. It was years ago, in a traditional calligraphy class (I was learning italic at the time) that I first heard this. A beloved calligraphy teacher shared this reminder with the students, and it turns out it’s true. Though I encourage students in my classes to practice a few particular words that are fantastic for beginners, it really is important to move on to words that speak to you. Whether it’s someone else’s or your own, the process will be transformed. You’ll care about what you’re writing. So, here’s my reminder for you today, for #20calligraphy: write something meaningful to you. Write words you love. Write what you really want to say. Vent or dream or quote or write a letter to your dear grandmama on those pages. Get ink on the page. Don’t worry too much about making everything perfect. It’s a work in process, and that’s the fun (but don’t forget to practice those warm-up drills). Summer has flown by and if you're looking for one last hurrah for yourself and some friends, you can join the next Intro to Modern Calligraphy workshop at the cutest spot (imho) in Southeast Portland. 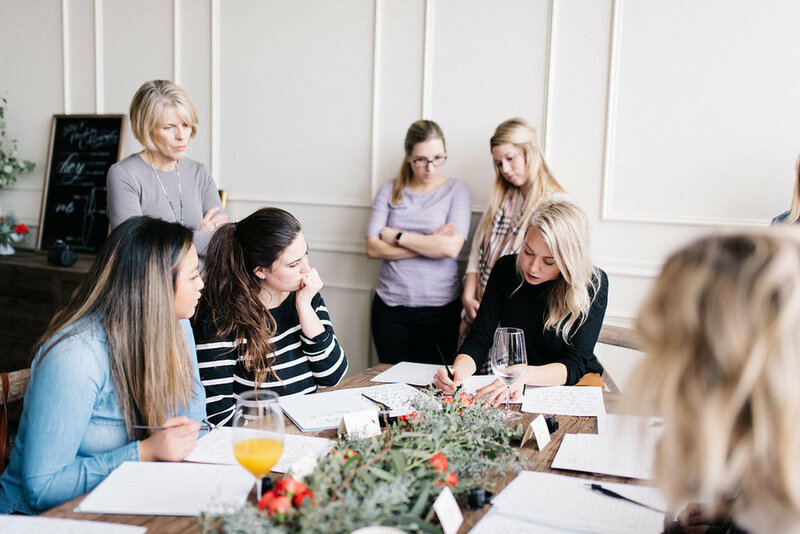 We'll cozy up at the lovely Tendue to gather in good company, sip some rosé, and learn all the basics of pointed pen calligraphy. I get a lot of questions about the pointed pen (it's the nib and pen holder I use to create the modern style of calligraphy you may have noticed) and the detail for this class. So I thought I'd address a few of them here. In the mean time, go snag a spot if you want to get your seat saved in the next class! If you're like me when I first picked up a calligraphy pen, you might be wondering which nibs are best for beginners and the best inks for practice paper. You may have even picked up a few nibs and pen holders that are lying around, barely used because you couldn't figure out how to hold the pen or get those flowing thick and thin lines. This workshop is for you. This is the class I wish I had when I was getting started. Skip the troubleshooting so you can put your time into practicing your letter forms and using the pen correctly. You'll also receive a curated calligraphy starter kit with all my favorite tried-and-true supplies that I still use and love. These interactive and hands-on workshops are the perfect excuse to learn something new, get creative, and build community around the table, workshop style! Introduction to Modern Calligraphy, Introduction to Brush Lettering, and Intermediate Calligraphy are currently offered at various venues in and around Portland, Oregon. If you've been wanting to get started on a calligraphy practice of your own, consider this your invitation! Join the next Intro to Brush Lettering Workshop in Portland, Oregon! I am looking forward to teaching the next Introduction to Brush Lettering workshop later this month! I always tell my students that I love working with a brush because it's a little more versatile than the pointed pen (which consists of a nib and pen holder) and I use it for a more fluid, casual look. Though the brush technique is based on the thicks and thins of creating letters with a nib, the bristles allows you to write on a variety of different surfaces with all kinds of inks and paints (whether it's on a rock, marble, chalkboard, sign, or any kind of non-paper surface, it's my go-to tool)! Also, it doesn't get more therapeutic than queuing up a favorite playlist, pulling out the ink and brush, and writing. Interested in learning? This class will cover beginning brush calligraphy techniques, exploring everything from how to hold the brush, create and shape letters, put together words and phrases to personalizing your style. In this interactive and hands on workshop, there’s time for instruction and practice and attendees will receive a curated starter kit with my favorite brush lettering materials. I'll be at City Home in SE Portland on June 24th—spots are going fast and I would love to have you join! 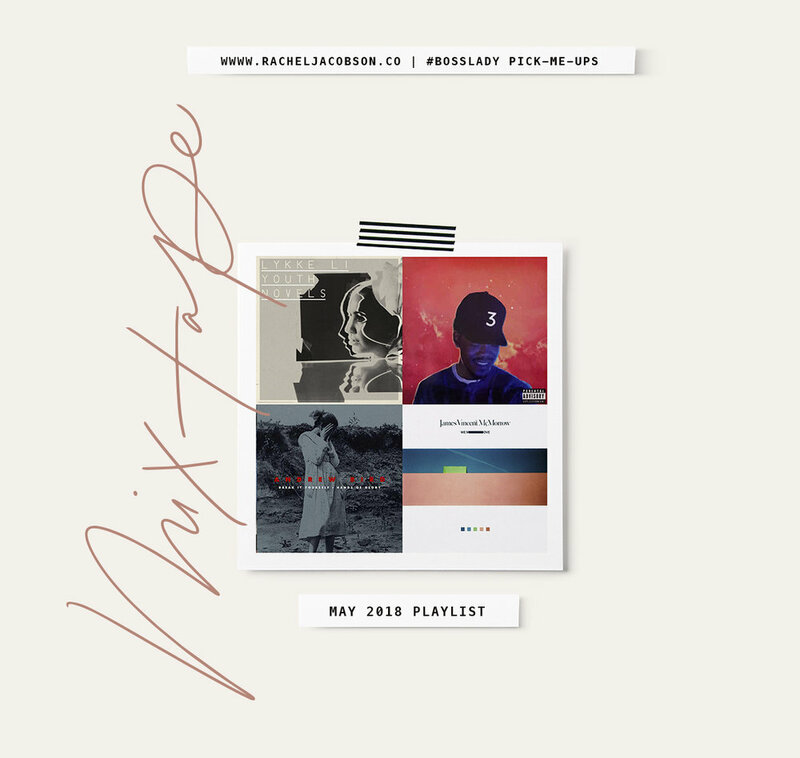 Introducing May Mix Tape, and all the songs that have been keeping me company while I've been working on logo designs, getting ink on paper, and—let's face it—taming my email inbox. Featuring a few new favorites (Chance the Rapper and James Vincent McMorrow, anyone?) and a few longtime loves (here's looking at you, Lauryn Hill), I'm not tired of any of these yet. I hope this playlist keeps you company and provides a little workday inspiration. And though there is a lettering playlist in the works, these songs will most likely be making an appearance at my next Intro to Modern Calligraphy Workshop. A good combination of calm and upbeat melodies are the best accompaniment to writing beautiful words and working with the pointed brush or pen, in my opinion. Happy listening! You have probably heard the phrase work smarter, not harder. While it certainly takes hard work to build an online business, there’s a lot of truth in the saying. In the early days of being my own boss, I had yet to discover the importance of systems. I was still figuring out all the things and reinventing the wheel each time an inquiry landed in my inbox. My lack of systems cost a time and energy. Out of necessity (and as my business grew), I began experimenting with platforms to help streamline my workflow. I wanted a wow-worthy client experience, but I knew I couldn’t do it on my own. 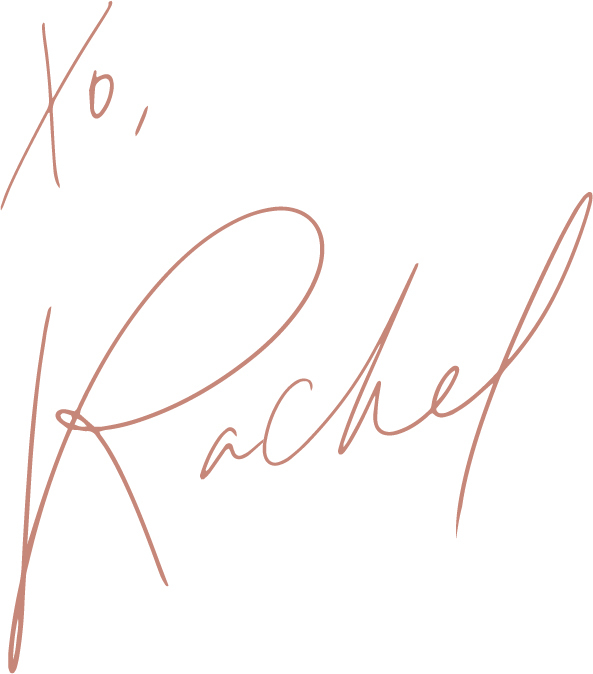 Through a lot of trial and error (and experimenting with countless programs), I’ve landed on some wonderful platforms that allow me to create exceptional client experiences and focus on the work that I love. I have been using Honeybook for the past couple of years and it has helped to transform and grow my business. I’d call it the workhorse of client management systems (plus contracts and invoices) and there’s not a lot it can’t do. Gone are the days of invoicing from one program, sending over contracts as an email attachment, and trying to keep track of client leads. Honeybook allows you to create workflow systems, task lists, and embed a contact form onto your website. And the icing on the cake? It's a cinch for clients to use. Which is a win/win in my book! Ever get tired of the back and forth of setting up calls and appointments?Yes, there's a better way. 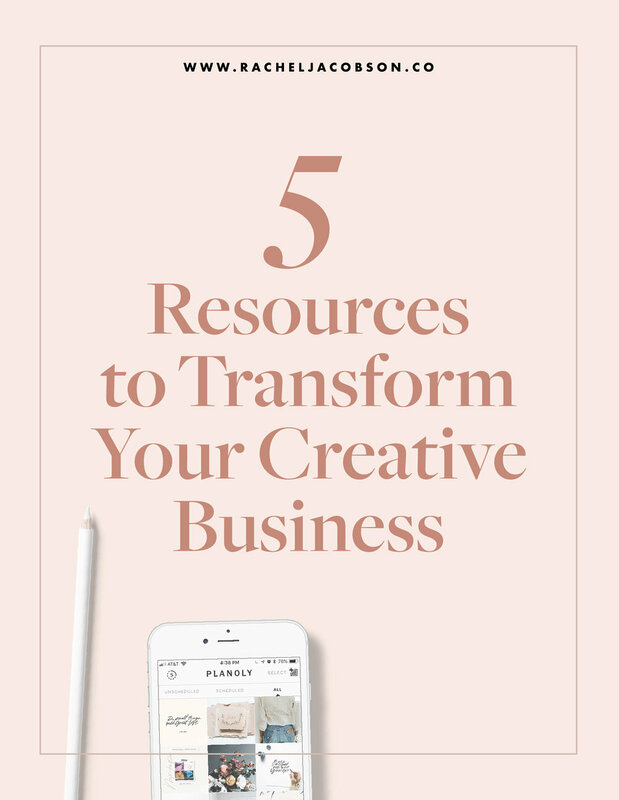 Being a creative business owner often means a full calendar and client’s have their own busy schedules to navigate as well. Now with Calendly, I simply block out windows of times for meetings and allow clients to select the time that best suits their schedule. Voilà! Scheduling made so much easier. Quickbooks and Mint have been a lifesaver. I used to dread bookkeeping and taxes. And I’ll let you guess what that says about how I was managing receipts. Let’s just say there was a lot to be desired. A few years in, I was determined to carve out healthier financial work/life systems and these two programs have been the the foundation. I can submit receipts and review transactions, view spending by category, and see a running total of tax estimations. And nothing feels better than being able to write that quarterly tax check knowing that I’m on track. When a new quarter rolls around, there’s less scrambling and more peace of mind. Now that’s something I’ll toast to! As a creative, I've spent more time than I care to admit planning out Instagram posts and curating a cohesive grid. There’s really no getting around it, right? But since it’s part of the job description, Planoly has been a game changer. It’s a planning, scheduling, analytics tracking, grid planning all-in-one system. And it alleviates the stress that comes with managing social media. While it won’t write your captions for you (which is probably for the best), you can arrange your photos to get a glimpse of the visual grid, draft an accompanying caption, and schedule post times (though auto posting is only available for Instagram business users). Essentially, you can trade in your “winging it” approach for a savvy social media plan with this platform. Count me in! This one probably goes without saying. Let's file this under mental health must haves as a creative online biz gal. Music changes everything and I think I might have a playlist for every aspect of my work day. While Spotify might not fall on the absolutely necessary list, I’d say it’s certainly essential for a lifegiving work day. I share a monthly playlist of songs I’ve been enjoying, which I’ve affectionately coined the Boss Lady Mixtape. Tune in here! What are your favorite platforms and systems for your business? Feel free to tell me in the comments!